Beginning aquarists might be surprised to find that moss doesn’t just grow in the forest: there are also aquarium that you can actually grow in your tank! One of the most popular types is Java moss. Wondering what Java moss is, how to grow Java moss in your own aquarium, or how to maintain your moss patch? 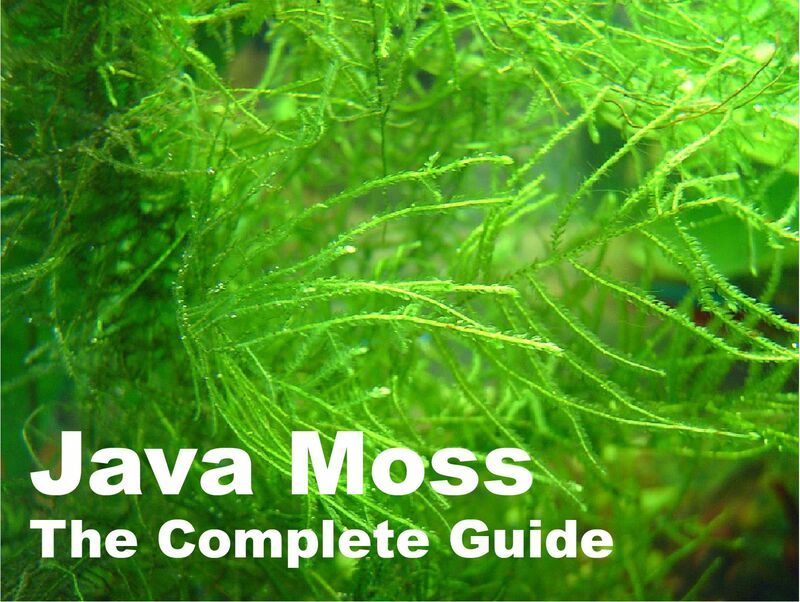 We’ve compiled the ultimate Java moss care guide that contains everything you need to know for explosive moss growth. As its common name suggests, Java moss is a type of moss that is naturally found in Southeast Asia. Its ability to grow submerged makes Java moss a candidate for your planted aquarium. And a good one at that – this moss is the most popular of the aquatic mosses and probably one of the overall most popular aquarium plants. Unlike most aquatic plants, Java moss doesn’t have roots. Instead, it’s comprised of tangled, thin green stems that feature tiny leaves. It uses these stems to firmly anchor itself to surfaces like rocks, rather than growing in the soil using roots for support. As with most plants that don’t grow in the soil, it absorbs nutrients through these leaves and stems, so it’s not a root feeder. So what makes Java moss so special that almost every aquarist has grown it at one time or another? The most important factor is probably its easy care. This is a very undemanding plant that works well for beginners and doesn’t require a green thumb at all. No high-tech aquarium set-ups and fancy dosing schedules needed here: low light works perfectly fine. Added nutrients in the form of liquid plant food or Co2 are appreciated but definitely not a necessity in most cases. In addition to its easy care, this stringy bright green moss is also very versatile. It doesn’t just have a decorative function in the aquarium; it also helps keep your tank stable and smaller inhabitants safe. You can place some Java moss on pretty much any surface and it’ll grow. Even if left free-floating this plant will thrive and eventually form dense clumps. Have we got your attention? Figured as much. We’ll discuss the ins and outs of Java moss care and maintenance below. When trying to grow any kind of plant it’s always a good idea to keep its natural growth range and habitat type in mind. After all, a plant grows best in the kind of environment it has evolved to adapt to! Java moss naturally occurs in Southeast Asia. Here, it can be found both above and below the water line (which means that you can also grow it emersed in paludariums and terrariums). The forested habitats you’ll find Java moss in are humid and the greatest concentrations of the plant are located at the edges of streams and ponds. Here, it often attaches itself to rocks and other surfaces and spreads by way of a creeping growth pattern. The plant has adapted to grow both in and out of water because the water level in these habitats can vary greatly. Once the rainy season rolls around the streams might rise enough to submerge the moss, which is not an issue for this plant at all. What does this moss need to thrive in your aquarium? As we’ve already briefly discussed in the introduction, not that much. All aquarium plants (and plants in general) need light to photosynthesize and grow. The difference between Java moss and many other aquarium plants is that it doesn’t need a lot of it. This makes it perfect for low-tech aquariums without fancy lighting systems. Do keep in mind that as with most plants, more light does result in a less spindly and lighter green plant, although the difference isn’t huge with Java moss. If you’re still on the hunt for a good light, check out our recent list of the best planted aquarium lights on the market. One of the many reasons aquarists have come to appreciate Java moss so much is its adaptability when it comes to temperatures. This moss is suitable for unheated aquariums as long as they’re at least around 59 °F/15 °C. Its ideal temperature range is in the low to mid-70’s (about 21-23 °F) but there is no cause for worry if your aquarium is a little more toasty than that. High temperatures are no problem for this plant either: up to 86 °F/30 °C should be tolerated without a problem. An important factor in growth for many aquatic plants (and especially Java moss) that is overlooked by many aquarists is water flow. A good current is necessary so fresh water can reach all parts of the moss. If this doesn’t happen, the inner parts might eventually start to brown and die off, especially if the moss is very dense. Don’t worry, your aquarium doesn’t have to resemble a raging river for Java moss to thrive: just the flow from your filter should usually be more than enough to keep this moss happy if you don’t let it grow too dense. This factor is not a big concern if you’d like to grow Java moss. The plant will almost always grow just fine (maybe not always thrive but at least grow) no matter your water values. It’s even one of the few aquatic plants that can handle low-end brackish water, making it perfect for your lightly salted aquariums. As long as things aren’t too extreme, Java moss will survive. As discussed before, neither added Co2 nor a nutrient dosing schedule will usually be necessary to grow Java moss. That being said, of course either will still be appreciated! If you’ve acquired your first tuft of Java moss it’s now time to get it to thrive. As you’ve probably correctly concluded from the previous there isn’t much you need to do, although there is a little bit of maintenance involved. Maintenance: trimming – Java moss will likely require a trim sooner or later to stay healthy, especially if it’s growing vigorously and densely. The reason you need to trim is not always aesthetic, as some aquarists like to just toss a ball of moss into their tanks so their fish can enjoy it and forget about it. The problem is that unless the water flow in your aquarium is really good, the middle parts of your Java moss ball/tree/wall will eventually become deprived of fresh water and start to suffocate. Parts of Java moss that aren’t receiving fresh water will eventually brown and die off, which means your moss will more or less start to decay from the inside out if you don’t do anything to stop it. If the moss was attached to a surface like driftwood or mesh, it might come loose because the inner parts keeping it attached have died. The solution is very simple: all you need to do is thin out the moss enough to ensure the water current can reach all parts of it. These regular trimmings are obviously also the ideal moment to keep the moss shaped the way it’s supposed to be. The parts you’ve removed are still completely viable and can regrow, so if you don’t want to throw them away you can toss them in another aquarium or give them to a fellow aquarist. As we’ve discussed, Java moss is one of the absolute most popular aquarium plants in the hobby. Although part of the reason aquarists love it so much is obviously its easy care, it’s also appreciated for its versatility and usefulness in your aquarium. This moss isn’t just decorative, it actually has a purpose! One very important reason for many fishkeepers to use Java moss in their tanks is that fish and (dwarf) shrimp like it. The fine strands make the perfect hiding place for small fry and dwarf shrimp, which will gladly use it as a nursery chamber and foraging field. It offers everything these small creatures need: cover, but also food in the form of biofilm that grows in textured places like these fine-leaved strands. Java moss is a favorite among shrimp keepers and fish breeders especially. If you grow moss in your shrimp tank you’ll see the little critters on there almost constantly, hiding from their larger tankmates and trying to find that yummy biofilm (which is an integral part of their diet). In addition to all this, Java moss also has an invisible advantage. Because it’s fast growing it makes a great nitrate buster: it considers compounds like nitrate and phosphate that are harmful to fish in large amounts to be tasty nutrients and will absorb them. Although you still have to do water changes as you normally would this can work wonders for the stability of your set-up. Java moss and other moss types are a long-time favorite in aquascaping. They’re a great way to add some texture to your scape and “greenify” parts of the tank like driftwood that might otherwise stay bare. This plant is especially perfect for low-tech aquascaping, a form of aquarium keeping that involves trying to achieve a lush and balanced look using as little equipment and “extras” as possible. That being said, Java moss does appreciate Co2, added nutrients and plenty of light and it will thrive especially well in high-tech aquariums. Free floating. This is obviously the easiest option, as it involves just tossing the moss into your tank and letting it do its thing. This method is not the most aesthetically pleasing in most cases, although a lush floating moss ball does make for a good jungle-effect. Most aquarists focused on their scape prefer one of the methods below. Java moss wall. You can use Java moss to cover the back pane of your aquarium for an intense pop of green. It can be a little tricky to set up your moss wall but once things are growing you’ll absolutely love the look of it. To grow a Java moss wall you’ll need some plastic mesh, tie wraps and four suction cups. The mesh should be double the length of the wall you’d like to cover, because we’re going to fold it in half to ‘sandwich’ the moss in the middle so it can’t float away. To attach the moss, simply spread a thin layer on half of the mesh. Then, fold the mesh and attach the sides with some tie wraps so the moss has no way to escape. Don’t worry about the ugly tie wraps ruining your aquascape, nor about how bare the moss wall looks right now. Once the moss has had some time to adjust and starts to grow in you won’t see any of the mesh or tie wraps any more. Attach the suction cups to your moss wall and then go ahead and set up the entire thing by securing it to the desired aquarium pane. Make sure no fish can get behind it and hurt themselves. After this all you’ve got to do is be patient and give the moss time to do its thing! Just as you can get Java moss to grow on the sides of your aquarium, it can also be used on the bottom. Starting your Java moss carpet is a little easier than a wall, although it will grow a little slower because of its location on the bottom of the tank where other objects block some of the light from reaching it. All you need is, again, some mesh. For a carpet it’s usually easiest to use something like window mesh or mosquito netting. Place the moss under the mesh and then weigh down the corners using rocks or other décor. A bit of substrate sprinkled onto the mesh can help prevent the inner parts from floating upwards. With time, the Java moss will grow through the mesh to form a dense green mat. You can attach Java moss to pretty much any surface and that includes décor like driftwood, rocks and commercial products like shrimp caves. The most popular option is the Java moss tree, which is made by supergluing Java moss onto branches using pieces of sponge for extra volume. Not your easiest décor option as you run the risk of the moss dying off if it becomes too dense, which results in the entire thing dislodging. Still, if you’re successful in making one of these trees it’s one of the most beautiful aquascape decorations around! Other surfaces we like to attach Java moss too are artificial hides like coconut caves and shrimp tubes. Just superglue the moss on there, again possibly using some sponge for volume, and leave it to grow. With regular trimming you should eventually end up with a decorative hide that your fish will really appreciate and that also blends in wonderfully with the rest of your aquascape. When it comes to propagation this moss is probably one of the easiest plants there is. Because it consists of separate tangled strands that can easily be pulled apart, all you have to do to turn Java moss into more Java moss is rip it to pieces. You can then use the separate pieces wherever you want and they’ll continue growing as if nothing ever happened. As mentioned earlier this means you don’t have to toss pieces of Java moss that you’ve removed while doing maintenance. Re-grow them or sell/give them away! Despite its hardiness and undemanding nature, your Java moss isn’t guaranteed to do well. In the world of (aquarium) plant growing, issues can always pop up. Luckily you should probably be able to ‘diagnose’ the problem relatively easy, which enables you to finetune your care and nurse the moss back to health. Probably the most common problem with Java moss is algae growth. Those little strands and fine leaves seem to be a magnet for green hair algae, which can quickly result in a green and tangled mess of moss and algae if you don’t manage to get the problem under control in time. It’s very difficult to get the algae off without damaging the moss itself (a toothbrush might prove helpful, though), so it’s better to prevent algae growth altogether. So how do you make sure your Java moss isn’t taken over by algae? Pretty much all algae is the result of some kind of imbalance in your aquarium. In the case of algae covered Java moss the most common culprit is too much light. You should only be using strong lighting if you’re also dosing Co2 and keeping an eye on your nutrients, otherwise your aquarium might quickly turn into an algae farm. Algae love all that light and the other plants will be unable to compete with them anymore because there is not enough of the Co2 and nutrients they also need, eventually resulting in a total takeover. Solving this issue is easy: dim your light or shorten the lighting schedule to see if that makes a difference. If you feel like the problem is something other than light, the next step is to test your water for excess nutrients like nitrate and phosphate. There is an imbalance somewhere; you just have to find it. If your Java moss seems to be turning brown and dying off it’s important to not just salvage what is left, but also fix the underlying problem. As we’ve discussed earlier, Java moss is prone to browning if it isn’t getting a constant supply of fresh water. If the moss is dying from the inside out then this is very likely the issue. Try to remove all the dead bits, reattach the moss if needed and then try to prune a little more aggressively and/or more frequently from now on. Also be sure to consider the water flow: is it too weak? Adjust accordingly. If your Java moss is dying all over instead of from the inside out then there is likely something else going on. Check your water values. How are the nutrients? If the plant is nutrient deprived it can eventually die off, an issue that can be fixed by setting up a nutrient dosing schedule. As we’ve mentioned before, Java moss is a highly popular aquarium plant. This means you shouldn’t have too much trouble finding it! Your local aquarium store will probably carry Java moss, although the quality can vary between stores depending on where they import from and how fast plants sell. A good option if you want to ensure you’re getting lush and healthy moss is to order online. Many online plant stores get their stock directly from the nursery or might even have their own nursery where they grow their plants. The few days it spends in a dark box while being shipped to your house won’t hurt your Java moss bunch at all. If you’re at the aquarium store and they’ve got one type of moss, it’s most likely Java moss. After all, this variety is the most popular of the aquatic mosses and also the easiest to find. If they sell multiple species and they aren’t all labeled that well, things might get confusing, though. There are many mosses out there in the aquarium trade! What you’re looking for if you need Java moss is a plant that doesn’t grow upright (flame moss, Taxiphyllum sp. “Flame moss”), downright (weeping moss, Vesicularia ferriei) or has a triangular growth pattern on the stems (Christmas moss, Vesicularia montagnei). Keep in mind that aquatic mosses can look different in varying growth conditions, especially in high vs low light. In low light, Java moss can appear more stringy and light green. In higher light conditions with added Co2 and the like, it might be much darker green and denser with more leaves.